A mosque constructed amid the sea with a thin path bringing the devotees to the dargah, Haji Ali Dargah is positioned 500 yards into the water and one can reach it only in the small flow. 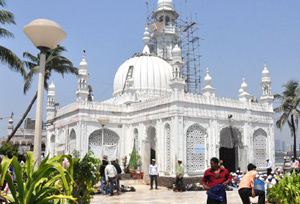 It is certainly one of the most popular Islamic sites positioned in southern part of Mumbai. It was erected by an affluent Muslim merchant who later happened to be a sage namely Haji Ali Shah Bukhari. A beautiful example of Indo-Islamic structural design, connected with myths about destined lover, it has the tomb of saint Haji Ali Shah Bukhari. It is not only notable among the Muslims, but many people of different caste and religions pay a visit to this place from wide and far. Around 15 thousands folks pay homage to the Dargah every day. And lacs of pilgrims pay a visit to the Dargah on the celebration of Eid-ul-Azha. It is built in respect of an affluent Muslim merchant named Haji Ali Shah Bukhari, who made a decision to leave his wealth before leaving for a sacred journey to Mecca. There is a myth that the Haji Ali was died drowning at the place where the mosque is standing today. Another legend says that once Haji Ali noticed a poor woman weeping on the road, carrying an empty pot. The saint asked her what the matter was, she told him that the oil she was holding spilled and if she didn't take it back her husband would beat her. When he got to know about the problem, the saint asked the woman to take him to the point where the oil got spilled. He dug a finger into the ground and the oil flowed out. The Woman couldn't express the happiness he got from this, as a result filled up the pot and set out for her place. It is a 400 year old architecture and is flaking in many places. Dargah is all set to reconstruct the structure by taking the permission from the state government. Gateway of India: It is a must explore spot during the trip to Mumbai. Situated at a distance of 8km from Haji Ali Dargah, gateway of India is standing with an elevation of 26m and has intricate latticework that allures the domestic as well as foreign travelers from wide and far. Moreover, the locals visit this place in the evening to relish the cool breeze away from the daily life. 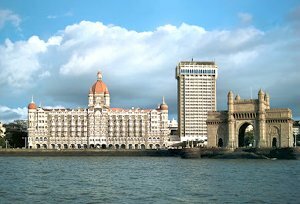 Marine Drive: One of the famous and most admired places of Mumbai, Marine Drive is also called by the name of Queen's necklace. There are many street food joints where visitors can relish having their favorite food to make their visit worthy and commendable. Essel World: Offering more than 40 adventurous rides and appeals, Essel World is the idyllic place to spend some time with the dear ones for a day vacation. Mahakali Caves: Positioned amid Borivali National Park and Aarey Milk Colony, Haji Ali Dargah also dubbed as Kondivita caves constructed during 1st century BCE to 6th century BCE. Juhu Beach: Among the famed beaches of India, Juhu Beach is the destination where one can have a glance at the houses of Bollywood stars. Moreover, Travelers can relish many things like dancing monkeys, donkey rides, cricket matches and many more. Siddhivinayak Temple: Dating back to 18th century, Siddhivinayak Temple is addressed to Lord shri Ganesh. It is erected by Deubai Patil and Laxman Vithu in the year 1801. Mani Bhavan: A museum situated at Laburnum Road in the lively city of Mumbai, Mani Bhavan displays various things related to the life of Gandhi such as books, rope bed, framed letters and Charkha. It is said that Gandhi gained knowledge on using chakra here only. By Air: Chhatrapati Shivaji International Airport would be the closest airport to make it to this sacred site, located just 10 miles away. By Rail: The railway station to Haji Ali is situated at a distance of 1 mile. One can easily take a taxi or an auto from the there to reach the place. By Road: It is well connected to the main cities of India by good motorable roads. Frequent bus service is available from the main cities of India including Hyderabad, Pune, Goa and many others.